$76.97 $109.95 As Low As $0.77 ea. 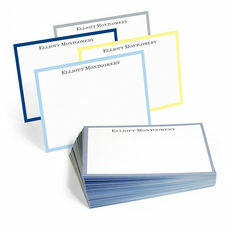 Set of 100 flat note cards on white stock. Border colors included are Chocolate, Chestnut, Aqua and Ice. Set includes 25 cards of each color. 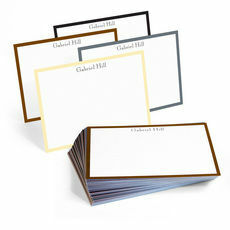 Personalization is flat printed in black ink. Your choice of typestyle. Blank white envelopes included. Size 6.25" x 4.5". Flat printed return address available. Positioning only as shown.